There was much less sobbing than I expected, even considering what happens right at the beginning of the book (no spoilers). I am mad at the universe for taking Pratchett from us so soon (especially since I’ve been rereading Douglas Adams and I’m mad about that all over again), but I knew Pratchett wouldn’t let me down. His final Discworld book checks back in with Tiffany Aching, teenage witch and all-around badass. The elves are trying to break out of fairyland and wreak havoc in the Discworld, and the witches (and the Nac Mac Feegle) must guard the borders between the lands and do what they can to defeat the wicked elves. Tiffany, the Witch of the Chalk, the Hag o’ the Hills, is in charge of the resistance, and we see how much she’s grown and how powerful she’s still becoming. There are some new faces, and some old friends, and some lessons that the old way isn’t always the best way. The thing I’m trying not to spoil adds an undercurrent of sadness to the whole book. It makes sense in a weird way, though, and the tone of the whole thing feels like a goodbye, and like a reassurance that it’ll be okay. Dammit, now I’m sniffly. 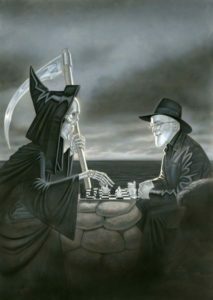 Readers from all the worlds miss you, Sir Pratchett, and I’m grateful for all the wonderfulness you left behind. Share the post "An emotional but worthwhile journey"